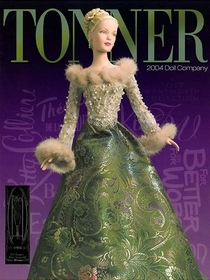 Tyler Wentworth; Matt O'Neill; Ready-To-Wear-Boutique; Théâtre de la Mode Collection; 8", 14" and 29" Betsy McCall; 8", 10" and 18" Mary Engelbreit; For Better or For Worse; Tiny Kitty Collier and Kitty Collier. Includes descriptions; edition sizes, original retail prices and some dolls have full page photos. Every item in the collection is shown.